238 pages | 11 B/W Illus. While some theorists argue that medicine is caught in a relentless process of ‘geneticization’ and others offer a thesis of biomedicalization, there is still little research that explores how these effects are accomplished in practice. 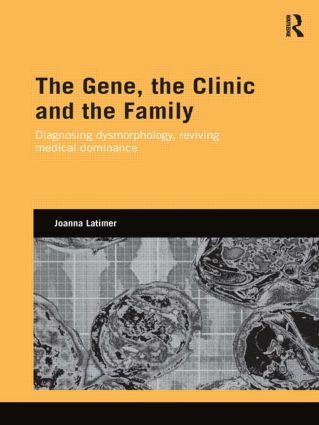 Joanna Latimer, whose groundbreaking ethnography on acute medicine gave us the social science classic The Conduct of Care, moves her focus from the bedside to the clinic in this in-depth study of genetic medicine. Against current thinking that proselytises the rise of laboratory science, Professor Latimer shows how the genetic clinic is at the heart of the revolution in the new genetics. Tracing how work on the abnormal in an embryonic genetic science, dysmorphology, is changing our thinking about the normal, The Gene, the Clinic, and the Family charts new understandings about family, procreation and choice. Far from medicine experiencing the much-proclaimed ‘death of the clinic’, this book shows how medicine is both reasserting its status as a science and revitalising its dominance over society, not only for now but for societies in the future. This book will appeal to students, scholars and professionals interested in medical sociology, science and technology studies, the anthropology of science, medical science and genetics, as well as genetic counselling. Joanna Latimer is Professor of Sociology at Cardiff University School of Social Sciences, and Professor in the ESRC Centre for the Economic and Social Aspects of Genomics. She has been researching medical knowledge and practice ethnographically for 30 years. Professor Latimer is editor of Sociology of Health and Illness, a member of the board of The Sociological Review, and chair of the Cardiff Ageing, Science and Older People Network. The books in this series, all based on original research, explore the social, economic and ethical consequences of the new genetic sciences. The series is based in the Cesagene, one of the centres forming the ESRC’s Genomics Network (EGN), the largest UK investment in social-science research on the implications of these innovations. With a mix of research monographs, edited collections, textbooks and a major new handbook, the series is a valuable contribution to the social analysis of developing and emergent bio-technologies.